New wristbands have hit the store and I couldn’t be more thrilled. The thing I love about wristbands is that they are present every day. You can get the reminder whether your motivation is waxing or waning, and their placement on the wrist ensures that wristbands don’t get overlooked. The eye-catching color of these particular wristbands is an added bonus. 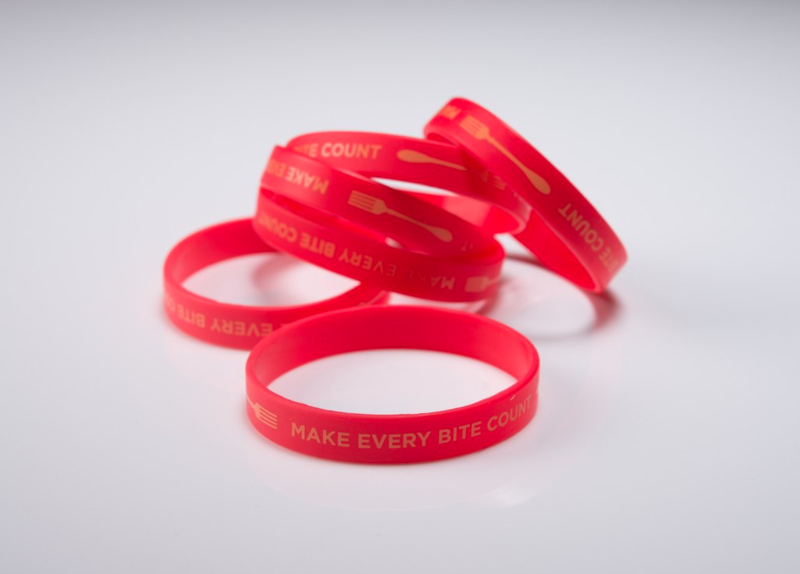 Today I want to celebrate the debut of these wristbands by featuring 3 activities that bring home the message that it’s important to make every bite count. These wristbands can be used as prizes for achievement and/or participation. Give each participant a blank sheet of paper and some colored pens or pencils. Have everyone write “Make Every Bite Count” in large letters in the middle of the page. Then, working individually, have each student write down words that can inspire them to make every bite count. Recommend varying the font size based on that idea’s importance to each student. Once everyone has created their word clouds, reconvene the group and discuss what they wrote. You can either collect their papers and turn them into a display, or create a larger word cloud on a piece of posterboard with everyone’s suggestions. Have each person bring in enough bite-size portions of their favorite healthful snack for each other member of the group to try. (Discuss food allergies and aversions before introducing this activity). As people snack, discuss what makes each food healthful. How does a single bite play into a larger eating pattern? Distribute one Make Every Bite Count wristband to each person, along with a few colorful sharpies. Discuss the key topics addressed in this page, highlighting MyPlate’s encouragement to make small changes and remember that every food and drink you consume matters. Have people decorate their wristbands with images of healthful foods and drinks or other reminders that every bite is important, keeping attention focused on the central premise highlighted on the band itself. This can be done in a group setting or individually at home.